Piano Concerto No. 21 in C Major, K. 467 ("Elvira Madigan") - Music Minus One composed by Wolfgang Amadeus Mozart (1756-1791). For solo piano. Classical Period and Play Along. SMP Level 10 (Advanced). Sheet music and accompaniment CD. Solo part, standard notation, fingerings and orchestral cues (does not include words to the songs). K. 467. 63 pages. Published by Music Minus One (MO.MMOCD3072).ISBN 1596150661. With solo part, standard notation, fingerings and orchestral cues (does not include words to the songs). Classical Period and Play Along. 9x12 inches.This justifiably famous piano concerto, with its gorgeous Andante theme, became a popular hit when it was used in the film Elvira Madigan. Lush melodies orchestrated in Mozart's inimitable style-graceful and elegant pianism are present throughout. The Classical piano concerto at its height! This deluxe 2CD set includes a slow-tempo practice version to help you get up to speed. 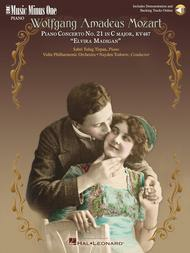 Includes printed music on high-quality ivory paper, with informative historical liner notes; a digital stereo compact disc featuring a complete performance of the concerto with orchestra and soloist, and a second performance minus you, the soloist; and a second compact disc containing a full-speed version of the complete version as well as a special -20% slow-tempo version of the accompaniment for practice purposes. The concerto is voluminously indexed for your practice and performance convenience.Conductor: Nayden Todorov. Soloist: Sabri Tulug Tirpan, piano. Ensemble: Vidin Philharmonic Orchestra.About SMP Level 10 (Advanced)Very advanced level, very difficult note reading, frequent time signature changes, virtuosic level technical facility needed.